Exploring Page And Screen – Run. Ride. Roam. A bit of rain about, so let’s leave the roaming of Oxford and take a trip through the countryside today. Through Oxfordshire we hurtled and arrived in the charming little village of Thame. Apart from being lovely, this little town has a claim to fame of having Midsomer Murders filmed there. Yep, we’re on the trail of Inspector Barnaby again! Actually, it was Steve who put this place on the list, he looked it up and he found it and he set the coordinates to take us there. Am I converting the Big Fella into a fan of British television I wonder? Will repeats of repeats of repeats of How I Met Your Mother be replaced by repeats of Lewis and Silent Witness? Will The Big Bang Theory have to move over for Foyle’s War? Will the crime fighting ways of NCIS have to make way for the fool proof criminal catching of Inspector George Gently? Is this a U.S. vs. Britain televisual showdown? Has Steve jumped ship, crossed the floor and moved camp to the British side? Hmmmmm, maybe not, but today he did make the supreme contribution of finding and taking us to Thame. I’m glad he did because it was a lovely place and is the location for Causton in Midsomer Murders. We started things off with a delightful English pastime and walked across the street to a tearoom. It even had the perfect name of ‘Treacles Tearoom’. So there we sat, in a lovely little tea room, with a quaint name, in the charming village of Thame a.k.a. Causton, watching the drizzle come down outside while enjoying tea and toast. How absolutely Britishly perfect! 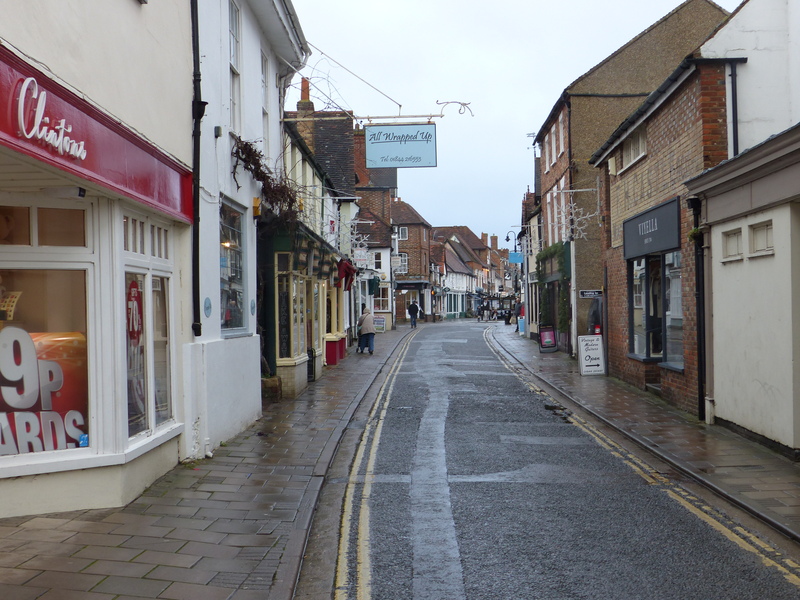 After enjoying our doorstop sized slices of multigrain and jam, accompanied by a pot of England’s finest tea bags, we headed out into the damp for a stroll around the village. There were a few places I could recognise, when I read about the scenes and episodes they had been in. TV associations aside, it was just a lovely little place, with beautiful, quaint buildings and narrow little streets. Just my kind of place. 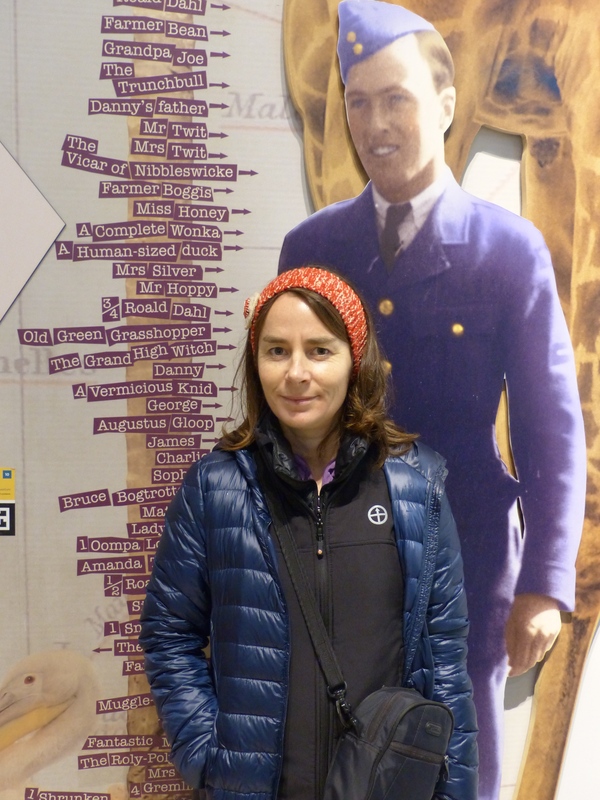 I went for the trifecta and after enjoying tea in a tea room and a stroll around a charming village, we headed to Waitrose supermarket to pick up a couple of supplies for the day. I love Waitrose! I’m called “Madam” in Waitrose! If I feel like some “Loov”, “Swee’art” or “Darlin’” I can head to Tesco, but if I feel like a dose of “Madam”, then Waitrose is the place to go! 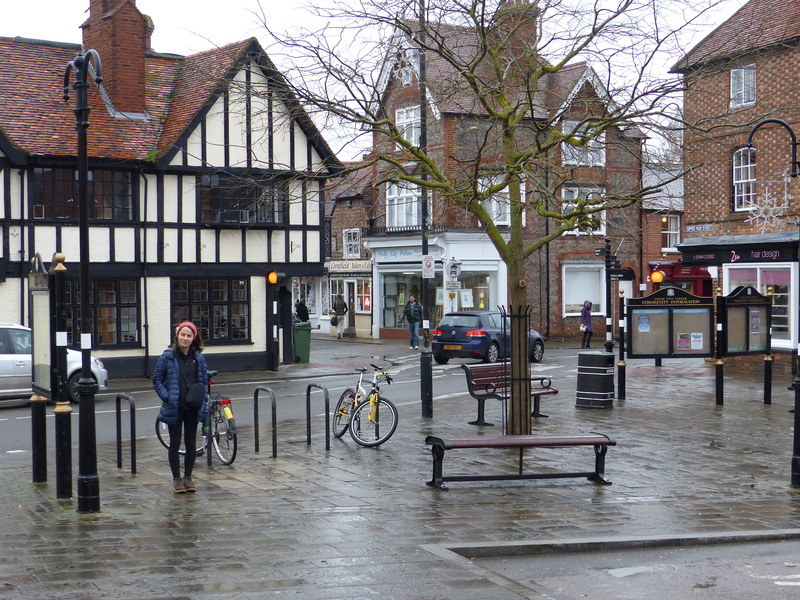 Thame delivered in many ways. Onward now, out of Oxfordshire and across the county boundary into Buckinghamshire again. 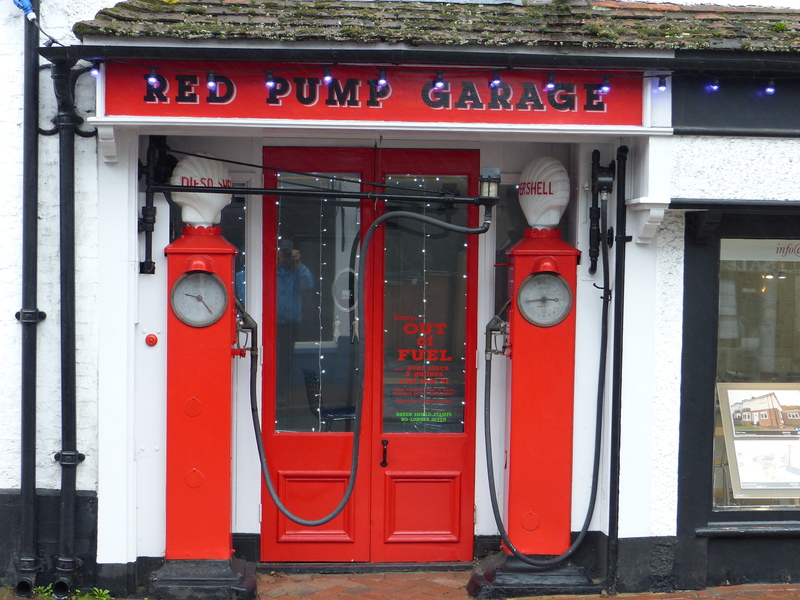 Destination…Great Missenden and the Roald Dahl Museum. Roald Dahl moved to Great Missenden in 1954 and lived there for 36 years, until his death in 1990. He wrote there, in a small hut at the bottom of his garden, which he set up with an armchair and he would sit for a couple of hours of a morning and a couple of hours in the afternoon and with pen and paper, sitting in his armchair, he would write the classics that so many adults and children know and love. I think, of all the books I’ve read in my lifetime, and there’s been zillions of them, both adult’s and children’s literature, I think Danny the Champion of the World is still one of my favourites. I have vivid memories of reading it for the first time in Primary School and have read it several times since and I still love it. I don’t know if it was because the underdogs won in the end, or if it was the pheasants being saved from the shoot, but it’s a favourite of mine to this day. 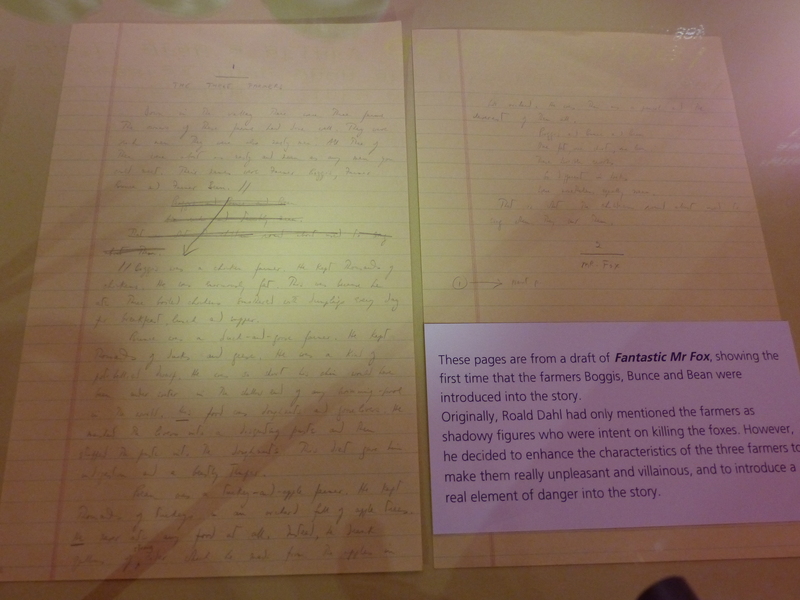 The museum gave information about Roald Dahl’s childhood and his time in the airforce, before he turned to writing, for which he achieved his fame. I also learned that Roald is a Norwegian name and is actually pronounced “Roo-arl”. There you go! Not the “Row-eld” as we’ve been pronouncing it. We discovered a couple of personal connections too. Well, not really, but we made the connections anyway. 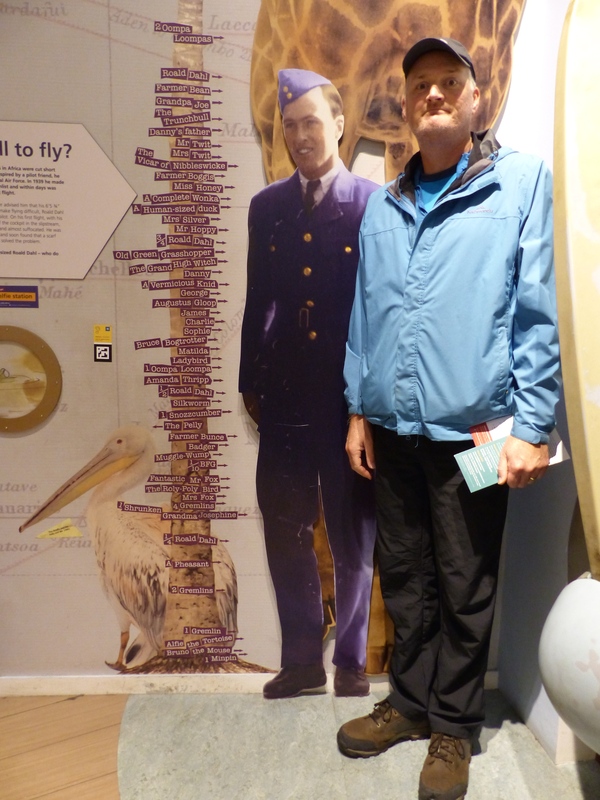 We discovered that Roald Dahl was a very tall fella, 6’5”¾ actually, so almost an inch taller than Steve. When he went to join the airforce at the outset of WWII, he was told he was too tall to fly the planes. He was determined and did it anyway, with his head sticking out of the cockpit. He just wrapped a scarf around his face against the cold and flew anyway. The connection to us?…The same thing happened to Steve. His first career choice was to be a RAF pilot, but he was told he was too tall and this could have some rather disastrous consequences if he ever needed to activate an ejector seat. So Big Steve’s dreams of flying Top Gun planes were thwarted by those excessive inches! Roald Dahl actually had a terrible plane crash when he was flying over Libya in 1940 and suffered severe injuries, including blindness and injuries to his face and back. He recovered, but suffered pain as a result of the crash, for the rest of his life. Steve doesn’t reach head height with many others! When I measured up, to see how tall I was, it turned out that I’m the same height as Mrs Silver, the character from Esio Trot. The connection to us?…The person who played Mrs Silver in the film version of Esio Trot was Dame Judi Dench. I love Judi Dench. She’s one of my all time favourite actors, who I also know is a member of the same vertically challenged team that I am, so I was rather chuffed to be the same height as her! At least I’m taller than an Oompa Loompa! 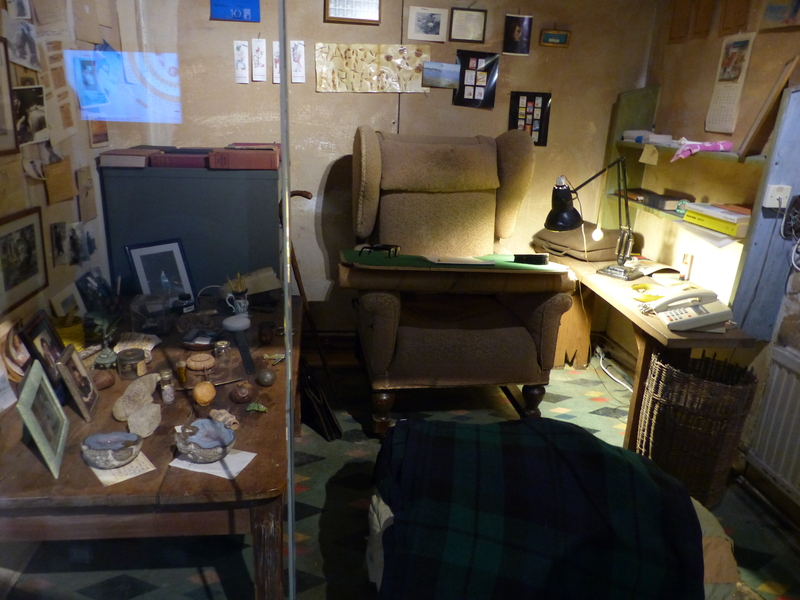 We saw Roald Dahl’s Writing Hut, which was exactly how his little room from the hut in his garden was set up. It was moved, exactly as it was, from the house, after he died and set up in the museum. They even pulled up the lino floor and included that, so it’s exactly as he would have used it. I loved that he just sat in a comfy chair, with a lap table and a pad and pen and just wrote. Nothing fancy, just ideas and a piece of paper to record them. Roald Dahl’s ideas book. 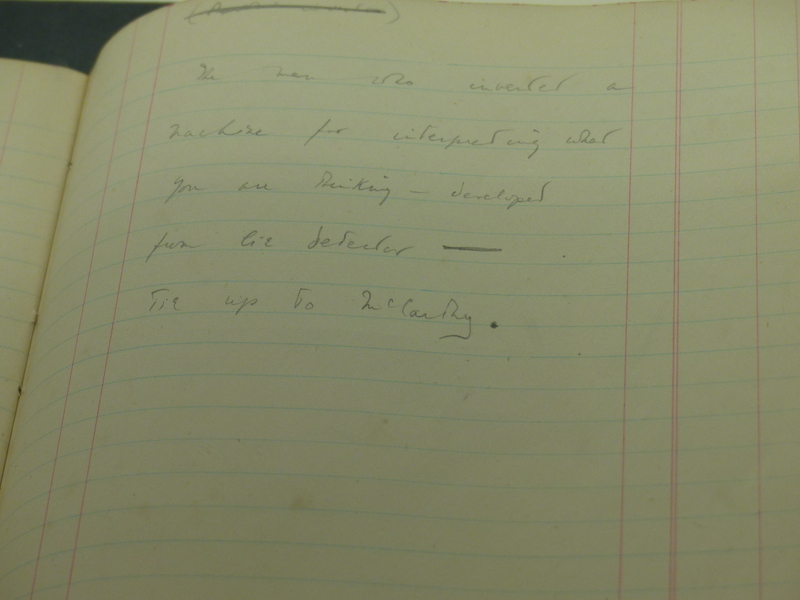 Just a simple notebook where he would jot his ideas, use some, discard others and those he did use, he would tick off in this book. I think we’ve already done a lot of that already! 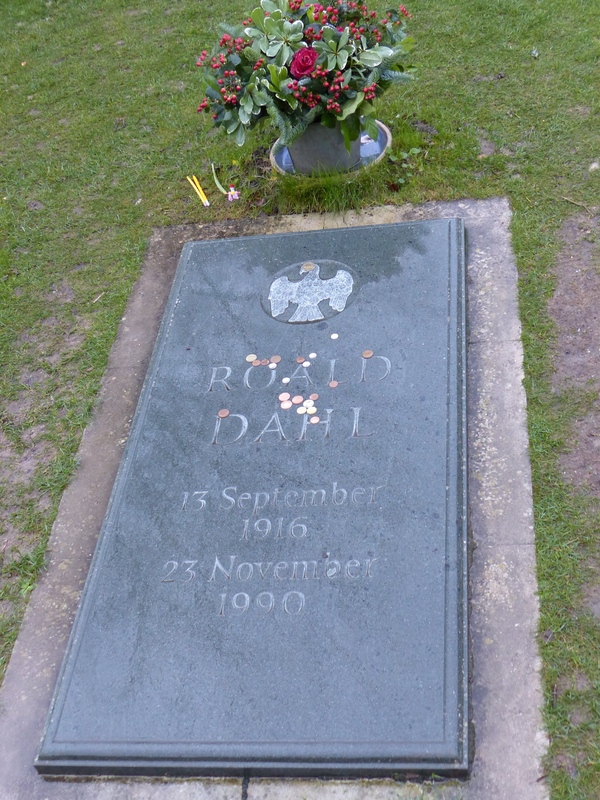 After the museum, we travelled a short distance up the road to see Roald Dahl’s grave, in a small, peaceful little churchyard. 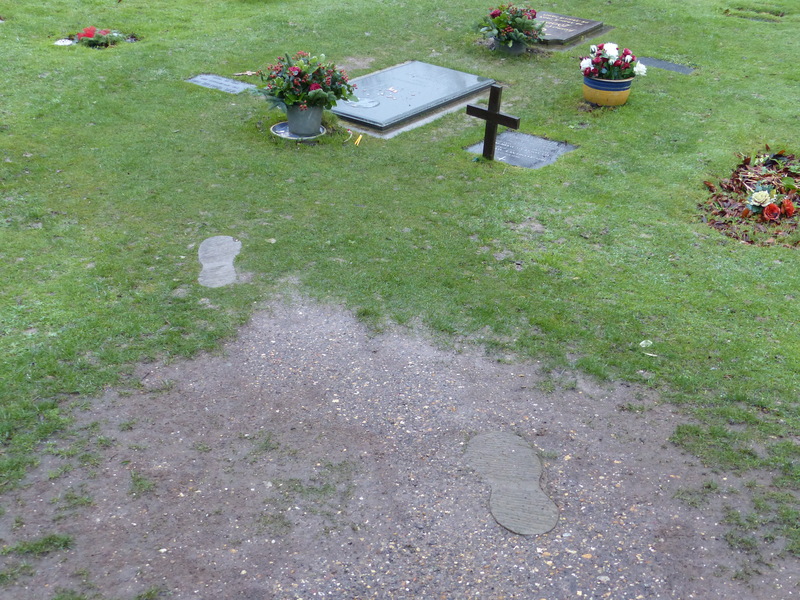 It was a simple headstone, but I liked the addition of the BFG’s footprints leading up to the grave. A smile inducing touch at what could otherwise be a quite sombre place.